Even with all those efforts, and really cool examples as shown on the great E-learning Heroes site, I constantly feel like I am working within boundaries to my creative thinking. I use Cathy Moore’s action mapping model extensively to uncover measurable outcomes and come up with well-designed real life activities to change behaviour. Why then does it feel like I am still restricted in what I can design? And why am I still slightly unhappy with the results of all my efforts, even if they have won the occasional award? Do today’s slide-based authoring tools restrict our creativity? Is this creating boundaries in my head? After pondering this question for a while now I think I have found an answer. For a number of years we have been forced into what I call “slide thinking”. E-learning is too much forced upon us as akin to a website, a PowerPoint. All the modern authoring tools used by thousands of designers and developers (and I definitely look at the ‘big three’: Articulate, Captivate, Lectora) work in screens, in slides. Everybody that still uses a storyboard also designs in screens: first you see this screen, then you see that screen. 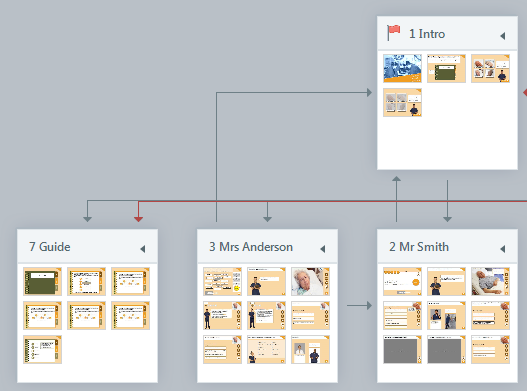 Try searching storyboard templates – see what I mean? The emphasis on clear navigation, knowing how to go to the next thing is imperative in our design thinking. Since when has this restrictive slide thinking happened to us? When I worked in e-learning 10-12 years ago, we didn’t. Makes sense, I guess, as there was no authoring software. We worked with amazing Flash developers who could make happen whatever activity or learning world our ID minds came up with (and they often made the end product even better that what I had in my head!). So how can we break free of “slide thinking”? Can we have Flash and its wonderful developers back? Not an option. Do we use other software, maybe game development engines like Unity to create worlds in which we discover information, try out actions and learn? This level of software is beyond quite a lot of us instructional designers – guess I am just lucky to be a programmer too :). If we are determined to create e-learning ‘modules’ in certain cases – and here I do humbly refer to other, modern day approaches to workplace learning as brought forward by Jane Hart – how do we make those online learning experiences fit into a learning world? Can they still fit into slide thinking software? This example on the Smartbuilder website gives me hope we can. Pulling game world and game level design into our learning design efforts may bring us to what I henceforth call the learning world design model. I want to spend time over the next months trying to develop such a model of thinking and will share my progress on this blog. I’d love to have this design model fit in with the easy-to-use authoring software if I can. But maybe we’ll have to leave development to specialists we closely collaborate with, like in Flash days? I am on a journey of discovery and a journey of model development. Stay tuned for learning world design #learningworlddesign. Great article. Will follow with interest.v At the games night we had recently I noticed that was something people really struggled with – trying to think of the learning game or game mechanics without already planning what tool to do it in. Thats why I loved those new adventure games people have made in Storyline. Having someone walk around exploring is so much less linear. I like the action blocks in Smartbuilder: its like coding for kids. I’m not sure its that different – I think we really need to change our design thinking. Work out what we want to do and then work out how to do it. I love your spotlighting of immersed discovery. Move away from linear transition of information, and give it to learners in a world where they pick parts appropriate for their stage of development. Like a sandbox game, where you can do what you want, but your character isn’t developed enough to take on a certain challenge, so you choose what you are ready for. I am currently working on a feasibility study on a mobile game for my companies ‘on job training’. A way of pushing out any changes to policy and procedures immediately, and in a dynamic and fun way.